Five-star Mövenpick Hotel Mansour Eddahbi Marrakech features 503 rooms and Morocco’s largest congress centre – Mövenpick Hotels & Resorts is very proud to open this landmark hotel. Dubai, UAE, 22 October 2016: Morocco welcomes the arrival of a significant new hotel with the opening of Mövenpick Hotel Mansour Eddahbi Marrakech, following a US$100 million redevelopment, invested by ALAJIAL Assets company, a subsidiary of AL AJIAL HOLDING that represents Kuwait Investment Authority in the Kingdom of Morocco. Opening to the public for the first time on 15 October 2016, the spectacular five-star hotel is a triumphant oasis, featuring 503 rooms and suites, six restaurants and lounges, a two-floor Ô de Rose spa and well-being centre by Cinq Mondes, four swimming pools including one for little travellers, a kids’ club, and exceptional events facilities including direct access to the Palais des Congr�s Marrakech. Already confirmed as the host venue for several major global events including COP22 and the Festival International de Film de Marrakech, Mövenpick Hotel Mansour Eddahbi Marrakech is rapidly establishing itself as a new global icon. Owned by Kuwait’s Al Ajial Asset Company, Mövenpick Hotel Mansour Eddahbi Marrakech has reopened under the management of Mövenpick Hotels & Resorts after completing an extensive renovation and expansion programme – making it the Swiss hospitality company’s third property in Morocco. Mövenpick Hotels & Resorts has already one hotel in Casablanca and one in Tangier. Inspired by the vision and achievements of Ahmed Al Mansour Eddahbi, Sultan of the Saadian dynasty, the hotel is a contemporary, refreshing haven from the enchanting buzz of the Red City, just a few minutes’ walk from the bustling Medina in the central L’Hivernage district, and only 15 minutes’ drive from Marrakech Menara Airport. The 503 guestrooms and suites – all featuring private balconies – include family, business and executive rooms, 108 interconnecting rooms, and additional suites housed in a newly built wing. Unique architectural details draw you in as you explore the oasis, including a refreshing arrival featuring a promenade that welcomes travellers with cool tranquil water features, 1,001 recessed candles, and elements of nature, wood, fire and copper all blended to create an extraordinary welcome. Throughout their stay, guests will enjoy the tranquillity of the vibrant gardens lush with bougainvillea, palm and olive trees. Five restaurants and a stunning rooftop lounge invite guests to explore Saadian culture, with each unique venue representing a chapter of Sultan Al Mansour Eddahbi’s story – from fine Moroccan cuisine at Dahbi, barbecue feasts at Jamra & Grill, and the evocative caidal tent setting of Saray, to Mediterranean specialities at Medi Terra, light bites and the renowned products from Mövenpick Fine Foods at the Nozha Coffee Shop & Takeaway or starlit evenings at the Manso Lounge on the rooftop. Taking its name from the traditional rosewater that perfumed the Saadian nobility for generations, Ô de Rose is a world-class spa and well-being experience expertly guided by the globally renowned Cinq Mondes brand. Spread across two floors, this haven of wellness features eight treatment cabins, hammams, a sauna, steam showers, Jacuzzi, nail studio and hair salon. Authentic Moroccan wellness experiences include purifying hammam rituals using traditional indigenous products such as argan oil, beldi black soap and rhassoul mud, and a unique Saadi ancestral ritual based on essential Dra� oils, which originate from the region where Mansour Eddahbi was born. This comprehensive array of impeccable leisure facilities is matched by a truly world-class business, events and exhibition offering. 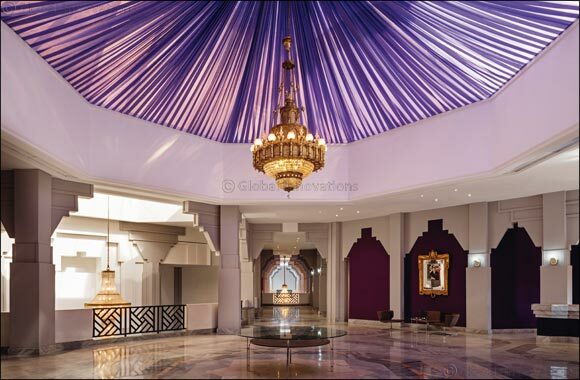 The hotel is directly connected to Morocco’s largest convention centre, the exceptional Palais des Congr�s, both physically via a dedicated entrance, and operationally thanks to Mövenpick Hotels & Resorts’ management of the renowned venue. It boasts a flexible function space of 5,600m2, including exhibition floor space of 2,700m2, the 1,700 m2 Royal Ballroom, two auditoriums with seating for up to 1489 guests, 20 meeting rooms and outdoor event areas. With a meticulous, dedicated events planning team and state-of-the-art technology, Mövenpick Hotel Mansour Eddahbi Marrakech and the Palais des Congr�s provide an unparalleled setting for major congresses, fashion and product launches, exhibitions, black-tie galas, concerts and theatre performances. Prices at Mövenpick Hotel Mansour Eddahbi Marrakech currently start from EUR125 per room, per night, based on two sharing, including breakfast and taxes.